photo-eye | BLOG: A Closer Look: AMC2 Issue 6: Space Conquerers! 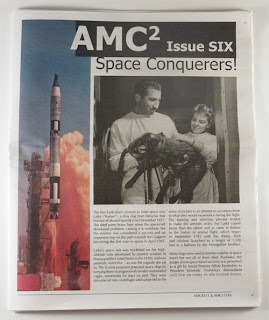 A Closer Look: AMC2 Issue 6: Space Conquerers! Amc2 Journal. Issue 6, edited by AMC. Published by Archive of Modern Conflict, 2013. 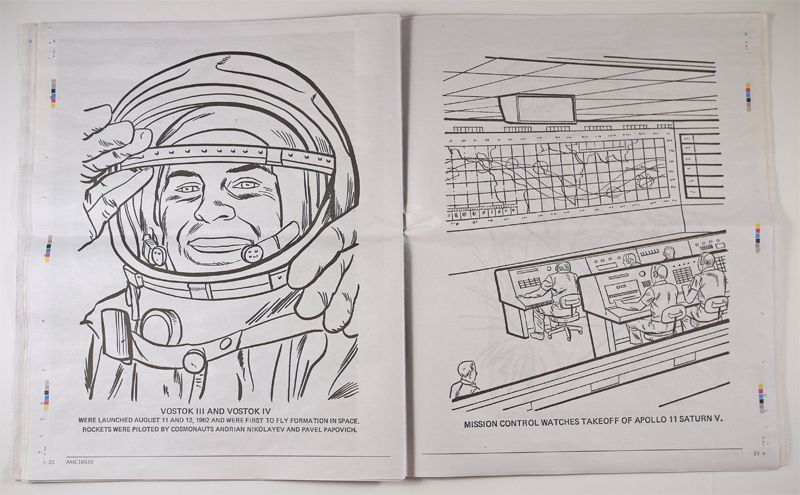 AMC2 Issue 6 comes to us in the form of a 32-page newsprint publication with the headline Space Conquerers! A launching rocket is pictured next to a sci-fi looking photograph of two people holding what we come to understand is a dog in a flight suit. The image doesn't seem real. With strapping, tubes and helmet, it's easy to miss the dog part and see the creature as a realization of a nightmarish Moebus illustration. The opening chunk of text puts this image into context. We read about Laika, the Russian stray who became the first terrestrial creature to enter space, and also the first to die, perishing from overheating and stress. 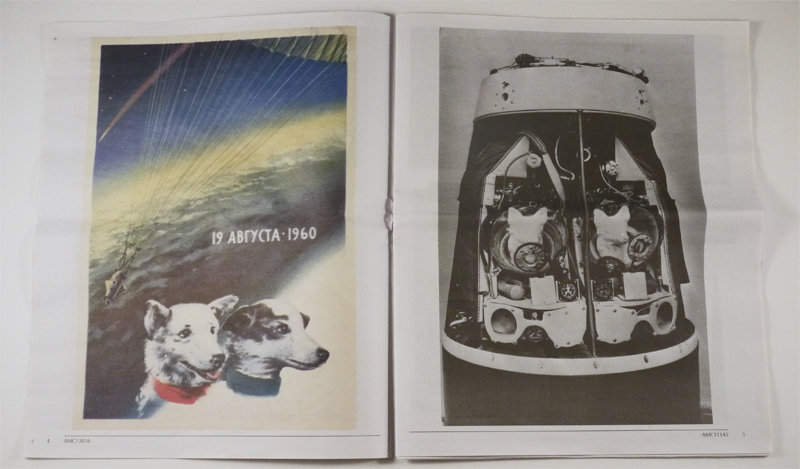 The next fuzzy cosmonauts fared better -- Belka and Strekla returned to earth to become much-loved icons of space exploration. 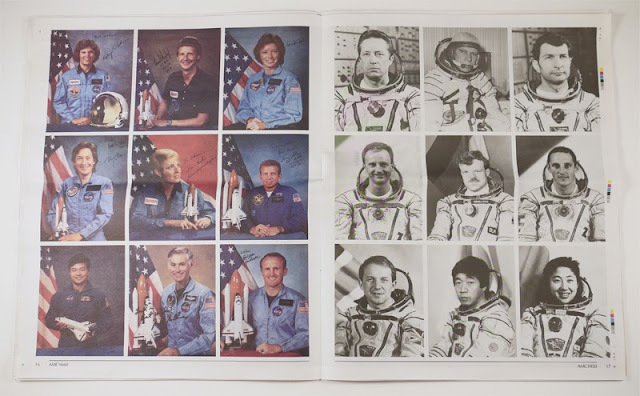 A few of their promotional appearances are pictured on the following pages -- two dogs depicted on stamps and in cartoon form, canine heroes of the space race. The images are charming also a bit strange after reading the text on the cover about the trials the dogs were put through before their selection for space travel -- training that is at times devastating for willing humans. The image of Baker the squirrel monkey sitting between her frightening looking space-travel restraint and her certificate of merit from the American Society for the Prevention of Cruelty to Animals shows the American side to these animal tests. 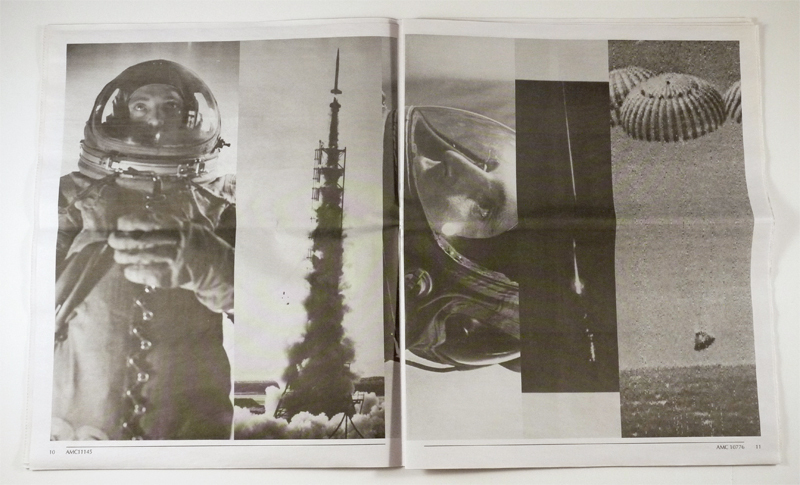 Another page and we are into human space flight and stirring and iconic images of men in globe-shaped helmets. Amc2 Journal. Issue 6, edited by AMC. Published by Archive of Modern Conflict, 2013. Issue 6 was assembled from the Archive's collection with the help of Cristina de Middel, whose recent book about an imagined African space program is now the stuff of photobook collector legend, and Thomas Mailaender, who has consistently proven his love and aptitude for the artistically strange. These seem like the prefect companions for such a project.